Malcolm II, King of Scots, pushed Alba's border far south to the River Tweed in 1018 when he conquered the Kingdom of Northumbria at the Battle of Carham. 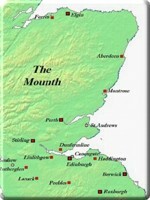 After completing its gradual incorporation of the kingdom of Strathclyde in the eleventh century, the Kingdom of Alba occupied most of the territory of present-day Scotland, save the Norse strongholds in Caithness, Sutherland, and the Isles. 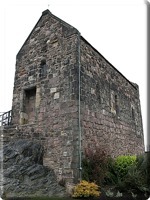 Amidst the power struggles of the twelfth and thirteenth centuries, the influence of European culture brought refinement to the Scottish court. 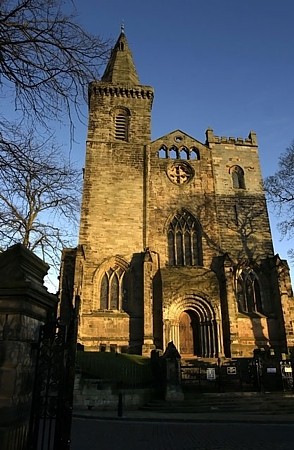 Saint Margaret, wife of Malcolm III, bore great fidelity to the Roman Catholic Church and founded several churches, including the Abbey of Dunfermline, built to enshrine her greatest treasure, a relic of the True Cross. St. Andrew's began to replace Iona as the center of ecclesiastical leadership as the rites of the Scottish church gradually came into line with mainstream Roman Catholicism. King David I, youngest son of Margaret, brought revolutionary changes to Scotland during his reign (1124-1153). The Norman Conquest of England in 1066 had brought Continental culture and institutions to the British Isles, and David eagerly adopted European models for religion, centralized government, social organization, economics, and more. As one of Scotland's greatest monastic patrons, David's deep piety and enthusiasm for Gregorian reform showed in the high number of monasteries he founded. 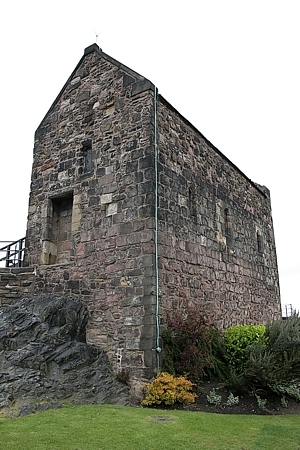 These monasteries, established by French or English monks, transformed Scottish life. Monasteries, particularly those of the Augustinian order, served as centres of learning at which men could be educated and trained to serve the crown's growing administrative needs. 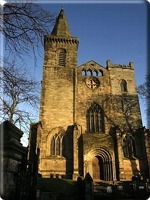 Meanwhile, Cistercians, who equated spiritual health with agricultural labour, introduced land-management techniques that transformed southern Scotland into one of northern Europe's main suppliers of wool. David's numerous and varied goals all began and ended with his determination to build a unified, centralized nation in the style of European feudalism. His royal residences and their mercantile and ecclesiastical satellite communities were fortified with lands owned by close friends and supporters, mostly French and Anglo-Norman knights and lords, who were bound to the royal court by feudal obligation. This new ruling class could provide the king with professional cavalries while tending to the administrative duties, such as law enforcement and taxation, of these newly-created sheriffdoms and judiciaries. As the feudal system took root in Scotland, the king was able to effectively administer far-reaching lands that had previously been able to avoid central oversight. 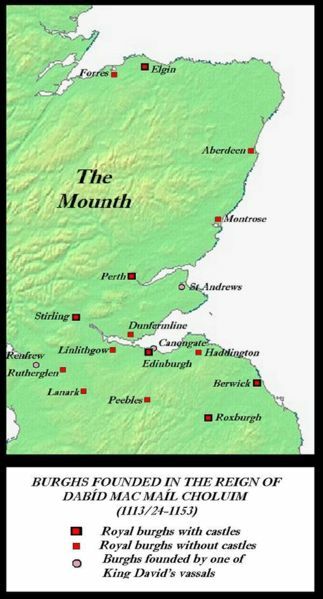 By the end of the twelfth century, Scottish kings had acquired sufficient authority to draw native Gaelic lords on peripheral territories such as Galloway, Moray, Ross, and Argyll under their supervision. No institution, however, shaped Scotland's long-term economic and ethnic divides than the creation of the burgh, a planned settlement with defined boundaries and guaranteed trading rights. David laid the foundations for Scotland's first true towns along the eastern seaboard, which would become English in culture and language. In time, the failure of the burghs to assimilate to Gaelic custom undermined the position of the native language and gave rise to the idea of a culturally distinct "Lowlands." Regional and international trade flourished in the burghs, generating commerce and capital that paid for the diversification of society and ensured further growth.